Look at 2 offers for your search. Pricehunter was able to locate article in 18 categories, ranging from £459.00 to £459.00. In total, Pricehunter was able to locate 2 proposals, from retailer such as Jacamo.co.uk and fashionworld.co.uk. The most offers (2) were found in the price range from £450.00 to £459.99. 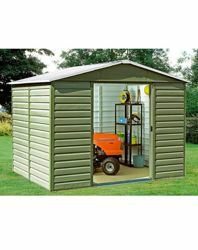 Customers who looked for this item also found Yardmaster Shed, yardmaster 10 and Yardmaster Sheds interesting.